You’re probably making at least one of these 4 big crossover mistakes. But they’re easy to correct if you know what to change. So let’s learn how to crossover more comfortably and confidently! In this video I identify the four biggest crossover mistakes I see skaters – AT ALL LEVELS – making, that cause their skating to be inefficient, and slow(er). We’ll hit the first two errors today, and then cover the others in the next episode. When you correct these mistakes in your skating, you’ll find yourself quickly adding laps to your 27-in-5 endurance test! Spinning wheels & losing power at the end of each stride. The fix: 90 degree strides, heel wheels leave the ground last. Lopsided skating. The fix: use both legs to power around the track! Practice the inside leg reach and pull. Crossing “over”. The fix: cross UNDER instead. Not enough weight transfer. The fix: my one weird weight-transfer trick. Today’s video will show you how to get into the right body and foot positioning to make the most out of every stride, every lap, so you can feel more comfortable in your crossovers, and be more efficient getting around the track. 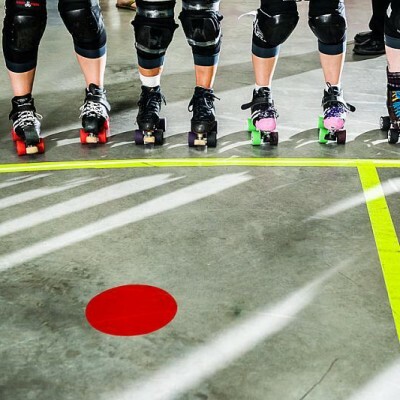 If you’re looking to speed up your jammer lap, or add a scootch to your 27-in-5 test, these fixes are going to help! Balance in the correct stride position (outside leg, inside leg – be sure to practice both on both sides!). Aim for 8 seconds of balancing to start, and work your way up to 20-30s each. Crossunder swipes – as shown in the video. Practice sets of 10-15 on each leg. Band or cable straight leg adductor exercise. Start with 3 sets of 10 per side, then increase the tension if possible. With all of the above exercises you can start out holding on to a chair or wall for balance while you get your body used to making these new and weird shapes. Work your way up to doing them with your own balance. Remember: the inside leg push follow-through position is awkward, but YOU CAN DO IT. 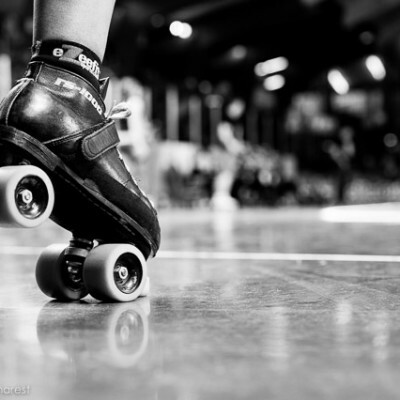 It takes a lot of practice and waking up some of the muscles in your legs that don’t always come out to play on their own, but I know that every single skater out there is capable, with practice! Hang in there! 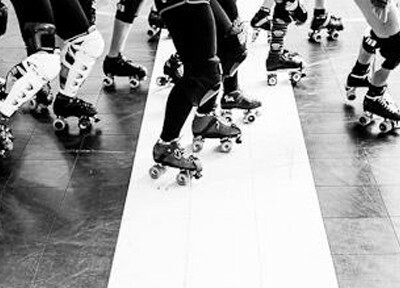 Want more awesome derby training tips like these? Did these tips help you? Feel weird? Make no sense? Please let me know in the comments – I want to hear from you! Hi. I really liked your crossover video. I’ve been out on LOA for a while and wasn’t consistent with my 27 in 5 anyway. I tried the ‘scraping’ exercise but I have neuropathy in my leg and it really hurts and is sensitive. Any suggestions? Ouch, so sorry to hear it, Tina. I think this is a better question for your doctor – I can only suggest that if it hurts you probably shouldn’t do that particular exercise with your condition unless advised otherwise by a medical pro. There are other adductor exercises you can try (like the band pull under I show towards the end of the video). Or: lying on your side, scoot your top leg forward, and raise your straight bottom leg, lower and repeat. Maybe one of those will work a little better for you. Otherwise if you can do the scrape exercise without scraping, i.e. sock feet on slippery floors, just to practice the positioning, it might be worth a try!